GREENSBORO, NC (Feb. 12, 2018) – Mack Trucks named Tri-State Truck Center of Memphis, Tennessee, its 2017 North American Dealer of the Year. Tri-State Truck Center, which opened in 1945, achieved 185 percent of its sales goal and 127 percent of its leasing plan in 2017. Rod and Jim Maddox, third-generation owners of Tri-State, operate nine full-service branches, including a new Little Rock, Arkansas, flagship store that opened in October 2017. Every Tri-State location in Tennessee, Mississippi, Missouri and Arkansas sells the entire range of Mack products, as well as provides leasing, parts, service and body shop services. Gabrielli Mack Sales & Service was also named U.S. Mack Financial Services Dealer of the Year, while Vision Truck Group of Cambridge, Ontario, was named Canada Mack Financial Services Dealer of the Year. The Mack Leasing North America Dealer of the Year Award went to Vanguard Truck Leasing. 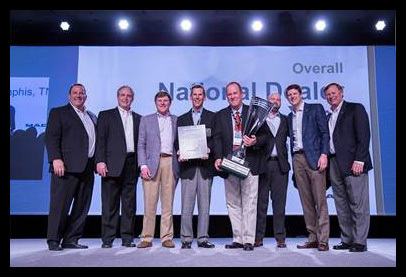 Bruckner Truck Sales, Inc., received the North America Remarketing Dealer of the Year Award, and the overall Customer Satisfaction Award went to Nextran Truck Center in Orlando, Florida.